On November 6, militants of the Kurdistan Freedom Hacks (TAK), an offshoot of the Kurdistan Workers’ Party (PKK) claimed to have planted a car bomb in the predominantly Kurdish city of Diyarbakir, causing at least 100 wounded and 11 dead. The self-proclaimed ‘Islamic State’ (ISIS) has also claimed responsibility for the attack, although officials still blame the PKK for the explosion, a conclusion based on audio intercepts. Prime Minister Binali Yildirim has also disclosed that one suspected member of the PKK was killed in the detonation. In the last years, Kurdish groups, far-left militants, and ISIS extremists have all been responsible for attacks on Turkish civilians. The blast occurred on November 4, only hours after the detentions of 12 lawmakers of the People’s Democratic Party (HDP), including co-leaders Selahattin Demirtaş and Figen Yuksekdag, in an overnight raid. Accused of disseminating terrorist propaganda, the deputies were jailed after their refusal to answer prosecutors’ questions regarding their alleged activities. As supporters took to the streets in four cities – Istanbul, Ankara, Izmir, and Antalya – in protest, their dissent resulted in a clash with Turkish riot police, who dispersed the crowds with tear gas and water cannons. Despite being usually seen as the most important pro-Kurdish party, the HDP appeals to a wide diversity of left-wing electorate, and is currently Turkey’s third largest party. Last year, and for the first time, HDP entered parliament, and currently holds 59 seats. The party also denies any involvement with the PKK. Following the November 4 detentions, the party voiced its outrage on twitter, announcing the “end of democracy” in Turkey. Via his lawyer, party co-chair Selahattin Demirtaş sent a message through facebook, declaring that “no matter what the circumstances are, [they] will continue [their] democratic and political struggle”. The party’s messages won’t be read in Turkey through social media platforms, however. At around 1:00 am (local time) on November 4, Facebook, Twitter, Youtube, and Whatsapp were ‘throttled’ (made slow to the point of unusability) by the Turkish government. When asked about these measures, Prime Minister Binali Yildirim replied that access would return to normal “once the danger is removed”. Media coverage on the car bomb has also been banned, in another government effort to control the country’s press, after shutting 15 media outlets on October 30. Those events bring to 160 the number of media platforms closed since last July. As the impact of the arrests was felt throughout the country, its currency hit a record low, and the actions of the Turkish government drew strong international condemnation. European Parliament President Martin Shultz believed that the actions “call into question the basis for the sustainable relationship between the EU and Turkey”. Federica Mogherini, High Representative of the EU, and Commissioner Johannes Hahn declared that the EU is ‘gravely concerned’ with the latest detentions. Turkey shares its NATO membership with Germany and Denmark, which have summoned Turkish diplomats, and also with US, whose government claimed to be ‘deeply disturbed’. Turkish Prime Minister Binali Yildirim, however, has explained that everything has been done “within the rule of law”. The current developments come at a time when Turkey is a crucial player among European states regarding the Syrian and Iraqi conflicts, reasons why its political path is being closely followed by Western allies. These events stem from an attempt to overthrow Recep Tayyip Erdoğan’s government that took place on July 15. The Turkish army, which has a history of political intervention – the country has witnessed four military coups since 1960 – blocked the Bosphorus strait and flew jet fighters and helicopters over the capital, Ankara. Explosions and gunshots were heard throughout Istanbul, and tanks brought the city to a standstill. 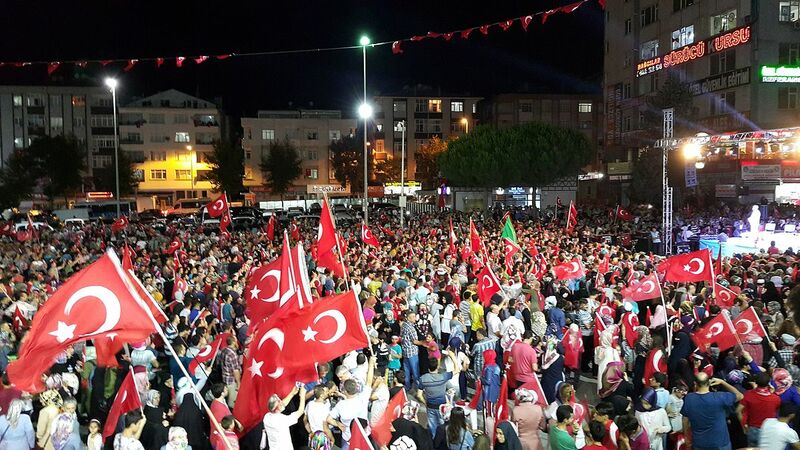 The parliament was bombed, presidential buildings fired upon, and the state’s TV station taken over, amid protests of Erdoğan’s supporters who took to the streets. In the end, the coup failed due to a lack of public support and wider military backing, as well as the soldiers’ failure to establish control. Ever since the attempted coup, Erdoğan’s government has suspended or fired approximately 110.000 people, 37.000 of whom have been arrested. The United Nations has warned the Turkish regime in light of those actions, claiming that its “steps to limit a broad range of human rights go beyond what can be justified”. Beyond the shutdown of media outlets throughout the country, there have been reports of torture and abuse of detainees. The country’s state of emergency, in effect since last July, has since been extended for an additional 3 months. The Turkish Prime-Minister has also declared that the country could reinstate the capital punishment if an agreement can be reached between political parties, despite being reminded by the EU that Turkey is bound by the European Convention of Human Rights, which bans the death penalty in the continent. On Saturday, November 5, European Commission President Jean-Claude Juncker has declared that sadly, “Turkey is moving away from Europe”.